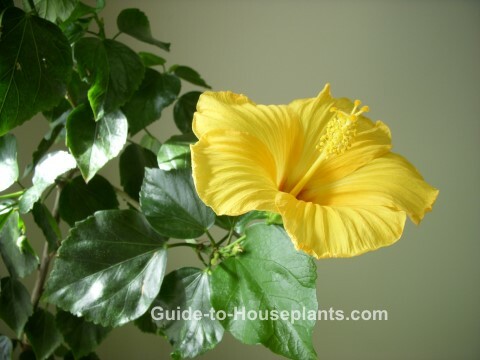 Growing hibiscus indoors allows you to show off these bright, tropical flowers in your home from spring to fall. This evergreen hibiscus shrub has upright branches densely covered with glossy, dark-green ovate leaves. Giant hibiscus flowers can grow 6-8 inches (15-20 cm) across, with ruffled, trumpet-shaped blooms in red, white, pink, yellow, peach, orange and purple. Flowers may be single, semi-double or double, depending on the variety. You can expect bloom life to be about 2-3 days, with a succession of blooms that last for months. 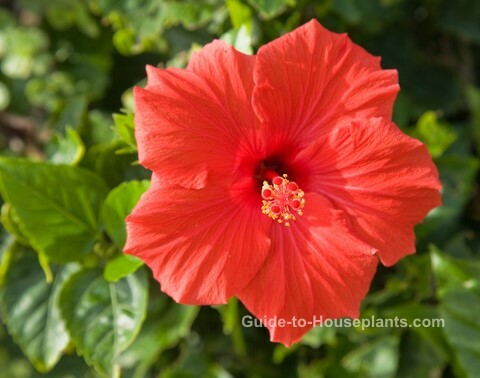 Caring for hibiscus plants is fairly easy if you keep a few things in mind. Let the sun shine in. Flowering plants need plenty of light to bloom. And this tropical beauty needs more than most. Keep it where it'll get a few hours of direct sun every day. If you put hibiscus outside for the summer, find a spot for it in a mostly sunny area and leave it there. Changes in light can cause it to drop its flower buds. Want more patio plant ideas? Take a look at ToBuildAGarden.com. Keep it warm. Hibiscus plants need warmth. That's not difficult to provide in a home. A sunny window will give it the light and warmth it needs to thrive. Pinch and prune. Unless you want a huge shrub in your home, pruning hibiscus is necessary. To control its size, prune it back in spring -- by half when necessary. Pinch growing tips to help it branch out. 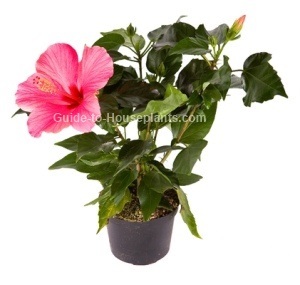 Hibiscus grows flower buds at the end of new branches, so you'll get more blooms this way. Give it a rest. Keep your hibiscus cool in winter (about 60°F/16°C) and allow soil to dry out between waterings. Repot in spring, using a pot just 1-2 inches (2.5 - 5 cm) larger. You can cut off about 1/3 of its roots before repotting to help keep the plant small. If it's already the size you want, top-dress every year by replacing the top 1-2 inches of soil. Growing hibiscus indoors is a little work, but worth it. You'll be rewarded with big, gorgeous flowers in vibrant colors. With good care, you'll enjoy your flowering plant for many years. You can buy hibiscus in the spring and summer, the heaviest bloom time. Choose one with plenty of flower buds -- a sign of a healthy plant. Hundreds of cultivars offer endless varieties to choose from. Pick the color you like. Height: 6 ft (1.8 m) or more if not pruned back. Light: Bright light with some direct sunlight. Plants that don't get enough light will grow tall and leggy, with few blooms. Growing hibiscus in a sunny spot outdoors for the summer will give it more blooming power. Just be sure to bring it back inside before the temperature drops to 50°F/10°C at night. It's tropical, not cold-hardy. Try to move your plant back inside gradually. Sudden changes in light can cause the leaves to turn yellow and drop off. Raising the humidity around the plant can help. Water: Water thoroughly and allow the top inch of soil to dry out between waterings. Put it in a pot with drainage holes to prevent soggy soil. Humidity: Moderate. If relative humidity falls below 50%, mist the foliage and place the pot on a tray of wet pebbles. Discover easy ways to increase humidity for your tropical houseplants. Temperature: Average to warm 65-85°F/18-29°C during the growing season; 60°F/16°C in winter. Soil: Use a fast-draining potting mix. You can use an all-purpose mix and add a little perlite. Fertilizer: Feed every 2 weeks with a low-phosphorus liquid fertilizer, such as 7-2-7, diluted by half while plant is growing and flowering. Propagation: Take 3 in (8 cm) stem tip cuttings in spring or early summer. Growing hibiscus from cuttings can take several weeks.